From rose gold and millennial pink to iridescent unicorn, we’ve given you a whole spectrum of beautiful color-inspired treats and merchandise this year. 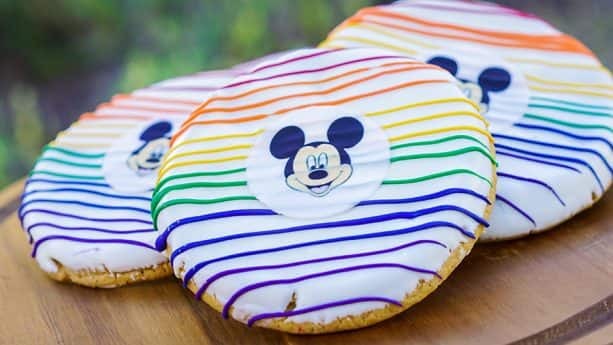 Come celebrate the colors of the rainbow – for a limited time, you’ll be able to find sweet rainbow goodies at Disneyland Resort! So grab those rainbow headbands and t-shirts and get your cameras ready, because you’ll DEFINITELY want to snap pics for your social media! I’ll start off my personal favorite Disney snack – the World of Color Crispy Treat. 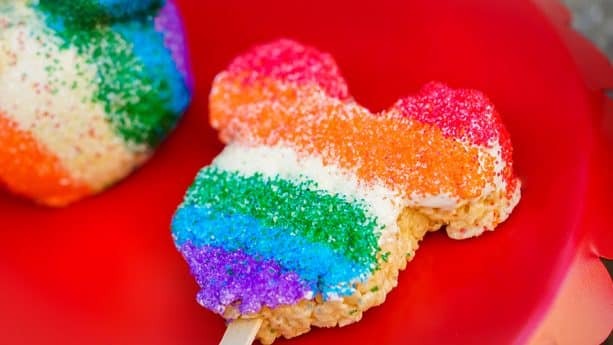 It’s Mickey-shaped, coated in icing, decorated with colored sugar, and served on a stick for an on-the-go bite! What more could you want? You’ll find it at all of the candy shops across property – Marceline’s Confectionery at the Downtown Disney District, Candy Palace and Pooh Corner at Disneyland park, and Trolley Treats and Bing Bong’s Sweet Stuff at Disney California Adventure park. Don’t be deceived by this cake’s commonplace appearance! It’s not what’s on the outside, but what’s on the inside that counts…and in this case it’s layers of RAINBOW CAKE! 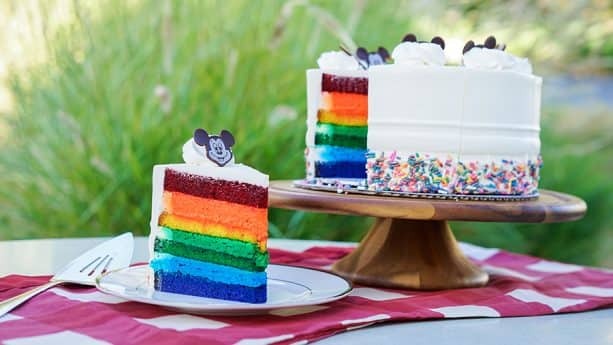 With layers of white chocolate mousse and red, orange, yellow, green, blue, and purple cake topped with buttercream frosting, rainbow sprinkles, and a Chocolate mickey, this yummy cake can be found at Plaza Inn at Disneyland park and at Pacific Wharf Café, Flo’s V8 Café, and Paradise Garden Grill at Disney California Adventure park. Craving a cookie? Try this Rainbow Cookie! It’s a sugar cookie topped with rainbow drizzle and an edible image of Mickey mouse. Find it at Disneyland park at Jolly Holiday Bakery Café, Plaza Inn, Market House, Coffee Cart near Central Plaza, Alien Pizza Planet, Galactic Grill, and Hungry Bear Restaurant. At Disney California Adventure park, you’ll find it as Fiddler, Fifer & Practical Café, Pacific Wharf Café, Corn Dog Castle, and Boardwalk Pizza and Pasta. 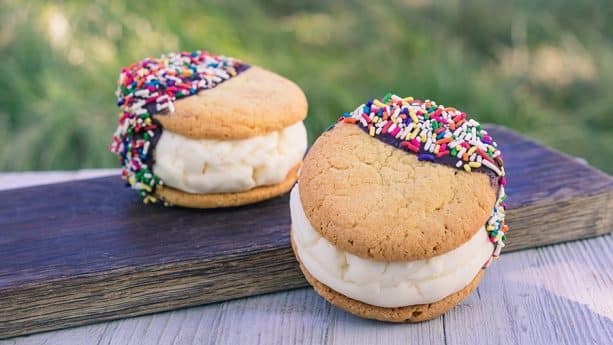 At Clarabelle’s Hand Scooped Ice Cream in Disney California Adventure park, you can get a Rainbow Sprinkles Cone or a Rainbow Ice Cream Sandwich – which is two cookies filled with vanilla ice cream, dipped in chocolate, and rolled in rainbow sprinkles. 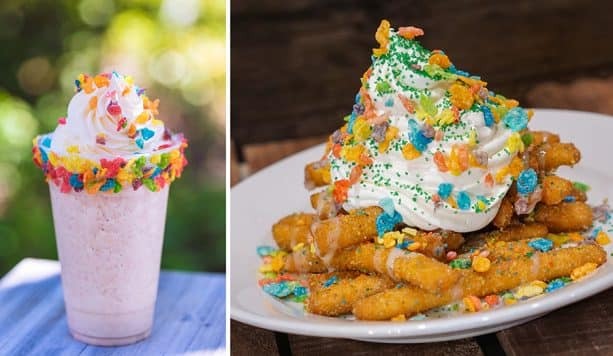 Schmoozies will be offering a Rainbow Rock Shake with rainbow cereal and whipped cream, and right next door at Award Weiners you’ll find Rainbow Funnel Cake Fries topped with Condensed Milk and Rainbow Cereal. The Cozy Cone Motel in Cars Land will also have rainbow cereal topped available with any soft-serve cone. Feeling a lil’ thirsty? Well, guests over the age of 21 can sip on the Fabulous Freeze at Hollywood Lounge. This rum runner comes topped with whipped cream and sour candy. And at Disney’s Paradise Pier Hotel, you can find a specialty beverage at PCH Grill, Surfside Lounge, and The Sand Bar. This specialty drink is made with grenadine, Blue Curacao, coconut rum, white rum, piña colada mix, and coconut water. 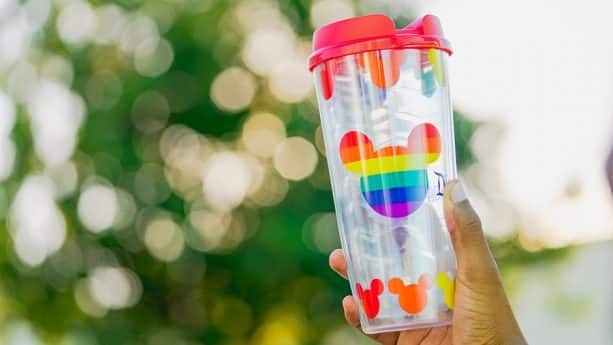 You can also quench your thirst with the Rainbow Tumbler! 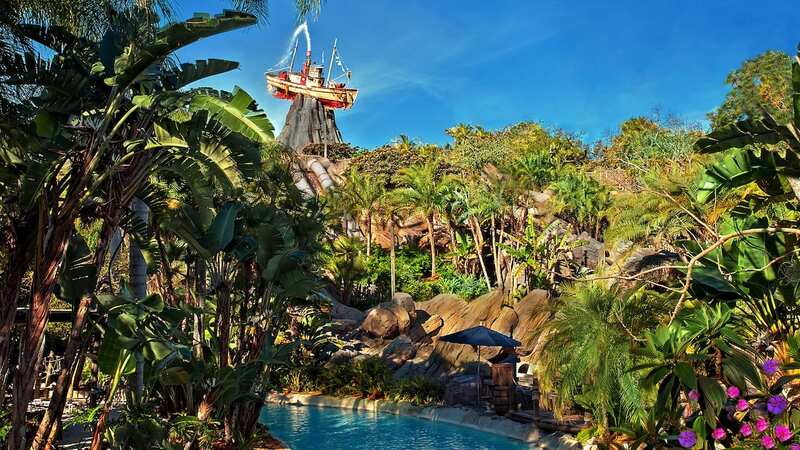 You’ll find it at a variety of quick service restaurants, carts, and kiosks throughout the resort with either your choice of fountain beverage or a flavored slushy. 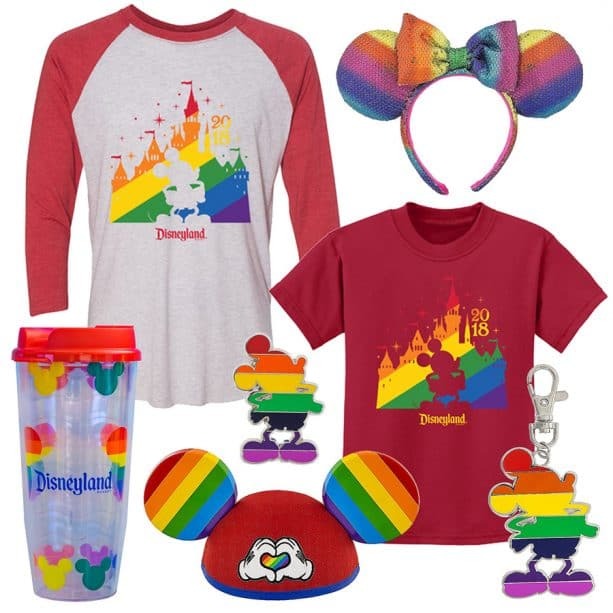 In addition to snacks and drinks, you can get your rainbow fix with some brightly colored rainbow merchandise! 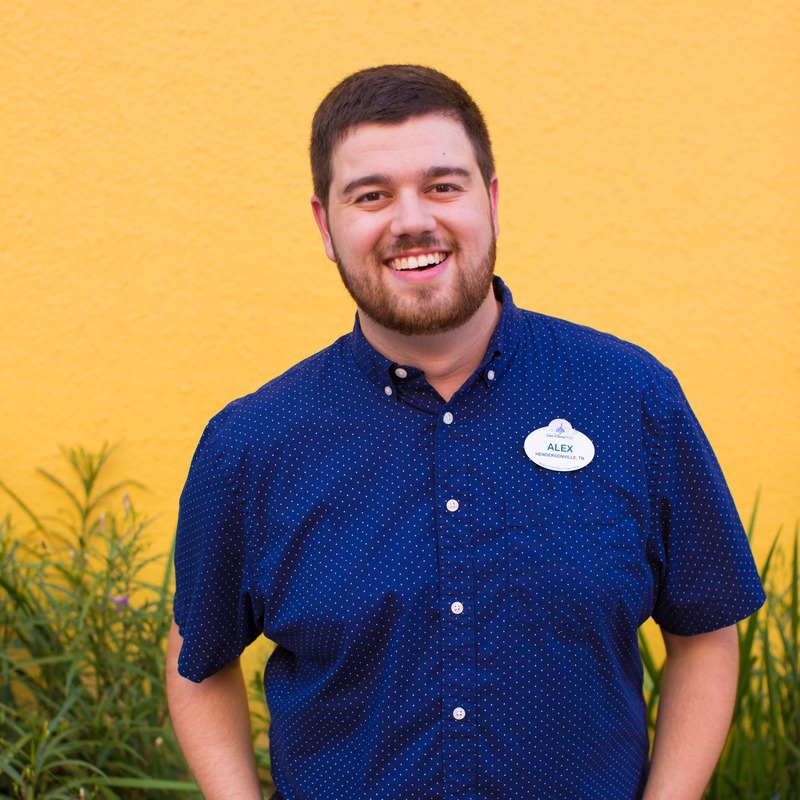 Get the 2018 Rainbow Disneyland shirt – whether it’s a raglan baseball tee or a youth shirt for the kids, you’ll definitely want to be wearing these when you get that cute foodie pic! And you know what looks great with those shirts? The Mickey Mouse Rainbow Ear Hat or the Minnie Mouse Rainbow Headband. Or if you’re a pin collector, you’ll want to grab the Mickey Mouse Rainbow Pin or Rainbow Lanyard Medal. These items can be found at various merchandise locations throughout the resort. So what are you waiting for? Put on those rainbow ears, come grab a rainbow treat, and snag that PERFECT pic before these treats go away! All food and beverage items will only be available Oct. 5-7, and all merchandise is available now while supplies last. For more information on the food & beverage and merchandise locations listed above, visit the Disneyland Resort website. I really want to buy a rainbow ears hat, but can’t get to the parks quickly. How can I order them online or by phone?? Shut up and take my money!! So excited to see so much rainbow gear coinciding with Gay Days at the park. 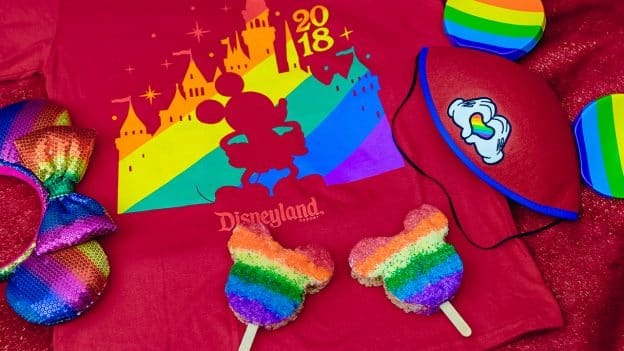 I hope the red rainbow t-shirt will be available on Shop Disney. I really want the shirt but can’t make it to Disneyland for a few weeks.